Tyler Florence‘s newest eatery is fast becoming a local watering hole, with eight craft beers on tap from California and beyond; with one coming from as far away as Germany and eight of the usual suspects of bottled and canned, this tavern is off to a good start in the beer drinking category! The menu is stylish for a tavern, with offerings of Organic Burrata, Tomales Bay Mussels and a Salmon BLT. 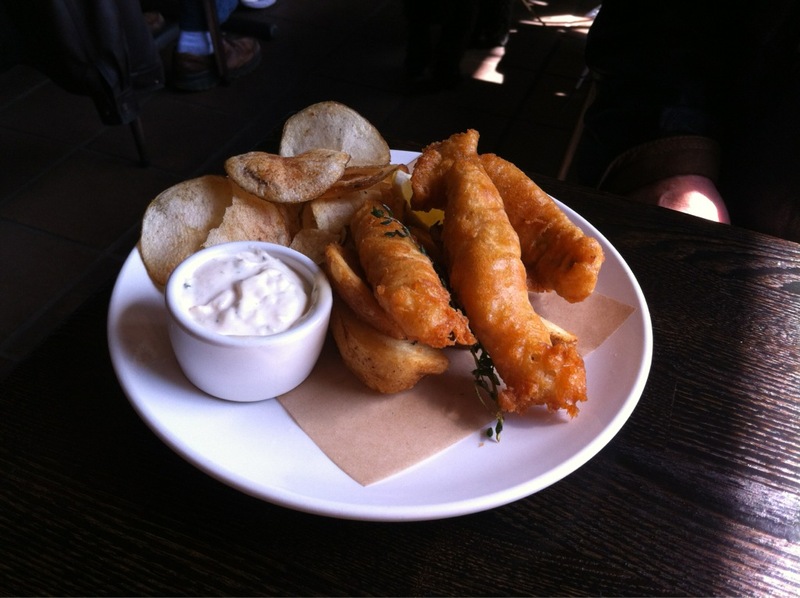 But we came for the Fish and Chips ($13****) ale-battered California cod, Kennebec potato wedges, lemon and tartar sauce and Fresh Baked Pretzels ($3*****) crusted with caraway salt and house-made mustard; oh, and a brew, of course! Something green is always a good way to start a meal. 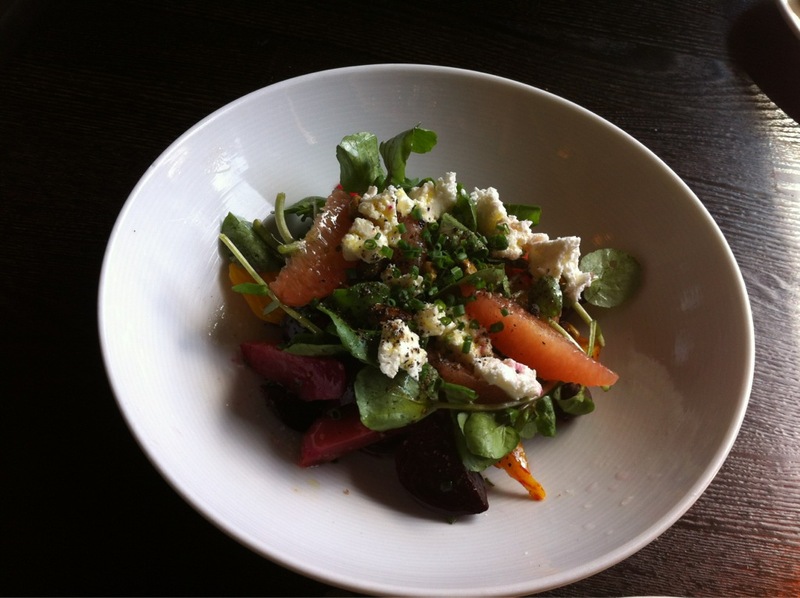 Here, I spotted a Chilled Beet Salad ($7****) with pistachio, goat cheese, grapefruit and watercress. But before our orders were placed, the waiter brought out a small, complimentary bowl of house-made potato chips. Nice. Unfortunately, they were a bit stale. But when our food came to the table, the Fish & Chips actually had both potato chips and the potato wedges! This time, the chips were very fresh and tasty. Warning: with only three finger-length pieces of fish this dish is small, so the addition of a pretzel is recommended! And what great pretzels they are. 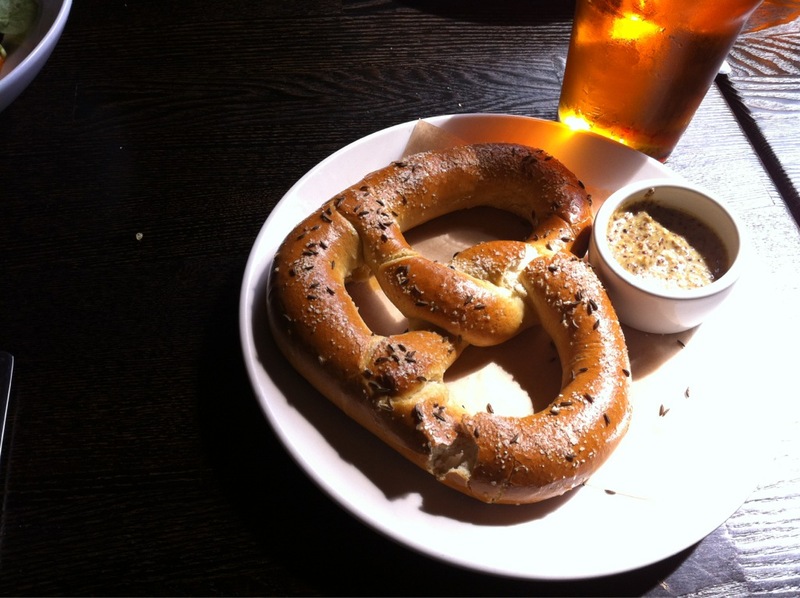 Dusted with caraway seeds, warm and soft; especially good dipped into the house-made mustard. The Chilled Beet Salad was superb and may be the best I have tasted with the added attraction of toasted pistachios and grapefruit slices giving an extra crunch along with a citrus note to the red, yellow and orange beets. Friendly service if, a bit slow. Good place to drop into for a beer or glass of wine and a small nosh.